Is the Colemak or Dvorak Keyboard Layout Best for You? Are you holding yourself back or possibly harming your health by typing on the QWERTY keyboard? In many ways, it is a standard just because it was used by our parents and their parents before them. In fact, QWERTY has not changed in the 140 years since 1873! If you want to know where you personally stand, head over to the Keyboard Layout Analyzer and paste a sample of the content that you write on a regular basis. It will crunch the numbers and tell you which keyboard layout is the best for you personally. It also has graphs and heat maps! For another writing sample, that included emails and blog posts Colemak came out as the most optimal layout. But regardless, why would a presumably sane person choose to continue to type on QWERTY, the 5th layout based upon the text that he types the most. As a professional programmer, I spend a massive amount of time at the computer writing. In fact, one of the reasons I have a MacBook Air instead of an iPad is that I type all of the time. For ergonomic reasons, I switched 22 days ago to the Dvorak Simplified Keyboard layout. The first day was really hard and I have subsequently improved my typing each day since. I had played with the idea of switching 3 or 4 times in the last 12 years, but finally decided that there would never be a better time and therefore made the leap! After several weeks, I like it a lot! The premise is that with a more optimal layout, one’s hands have to do far less moving which is healthier in the long run. Because I plan to be programming for at least 40 more years – into my seventies or beyond – I have made other ergonomic choices, such as using an external keyboard and monitor at my desk and using the mouse with my left hand even though I am right hand dominant. If you are wondering about the keys not matching what you type, there are several ways to physically adapt your keyboard to the new layout. This step is entirely optional and its arguably better to learn to touch type by forcing yourself to never look at the keyboard. kbcovers.com makes great protective covers for Apple keyboards that have the Dvorak layout professionally printed. It looks great. And the Model M keyboards from Unicomp has removable keycaps that are easy to rearrange to your liking. Masking tape work well if you want to just make your own labels. If you want to go all blackout and do not yet have a high quality external keyboard, then you could get a Das Keyboard Ultimate, which features blank keycaps on a nice mechanical key design. 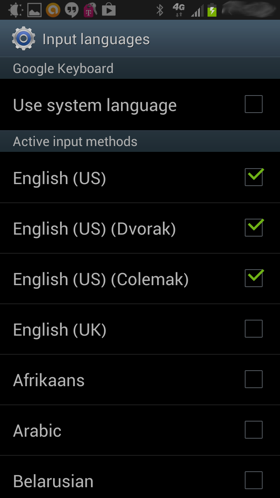 Additionally, the onscreen keyboard on the latest Google Keyboard for Android phone supports beth Colemak and Dvorak in the language settings. With English selected as the language, choose Dvorak (or Colemak) as the layout and tap the Add button. That’s it. 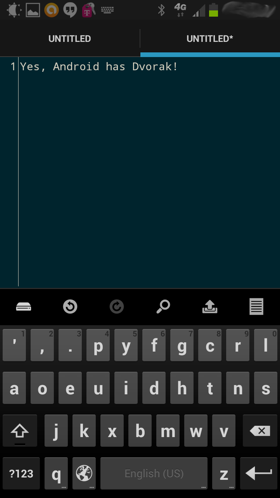 Now when your on-screen keyboard appears it will have your new keyboard layout! The point is, if you work on the computer all of the time then you owe it to yourself to consider which setup is best for you personally. It is worth the time investment to do what is best for you even if it is not the common standard. Evaluate what’s best for you personally and type on!